I’ve been working on a SCOM management pack during my spare time over the last couple of weeks. 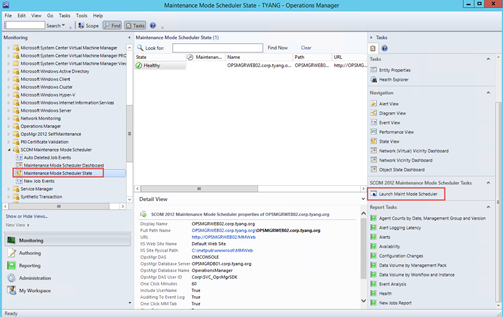 This management pack provides some basic monitoring for the SCOM 2012 Maintenance Mode Scheduler Version 2 developed by Tim McFadden (http://www.scom2k7.com/scom-2012-maintenance-mode-scheduler-2/). 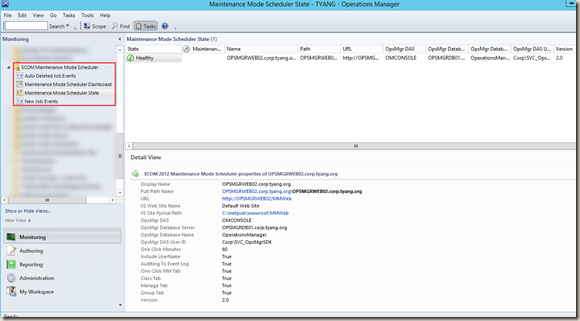 Class definitions and discoveries for the SCOM 2012 Maintenance Mode Scheduler. The monitoring MP defines 2 classes. 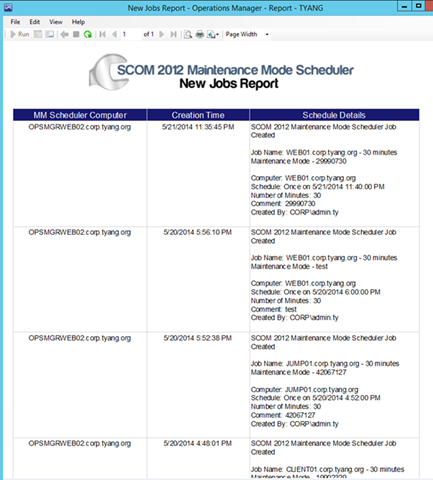 a Microsoft.Windows.ComputerRole based class called “SCOM 2012 Maintenance Mode Scheduler”, which has many properties defined representing various application settings. 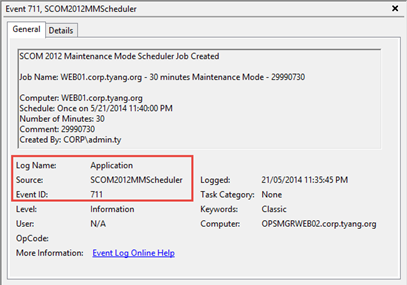 There is also an unhosted class called “SCOM 2012 Maintenance Mode Scheduler Event Collector”. 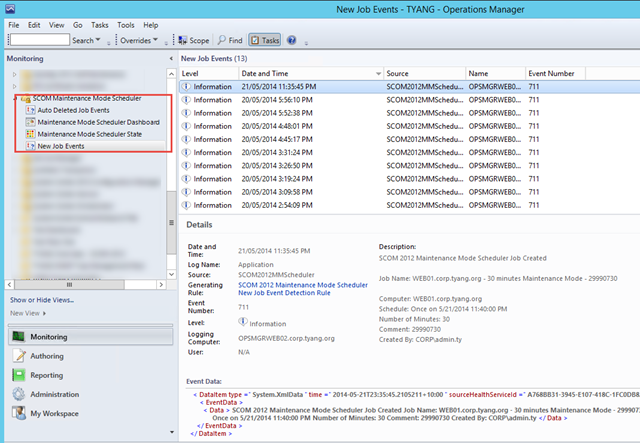 This class runs an event collection rule which collects the new schedule jobs creation events even when the Maintenance Mode Scheduler computer is in maintenance mode. 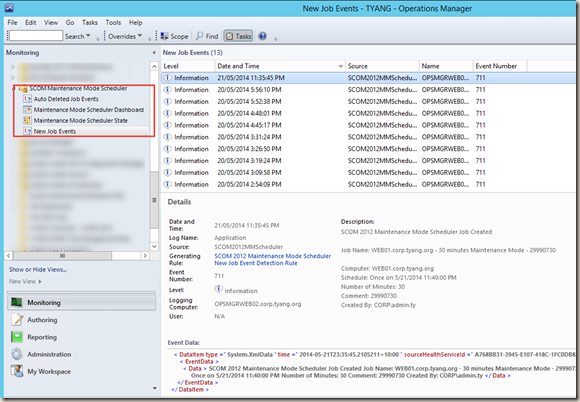 A rule runs once a day and executes a script to scan through all Windows Scheduled Tasks created by the maintenance mode scheduler and deletes any tasks that does not have a Next Run Time (i.e. tasks that only runs once and it has already be executed). 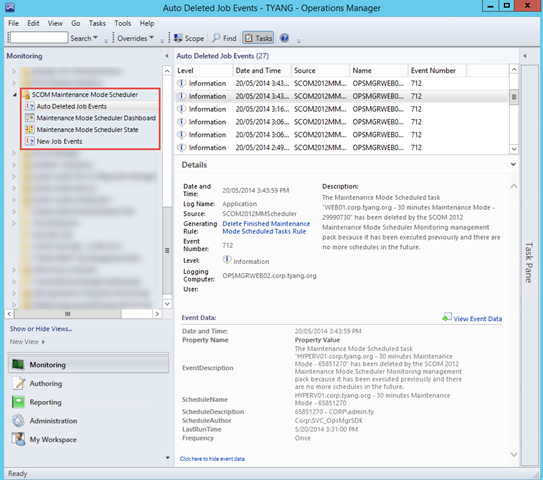 For auditing purposes, when deleting each old (finished) task, an event is also written to both SCOM operational and Data Warehouse databases. The purpose of this rule is to eliminate the needs for manual clean-up of old scheduled tasks created by the maintenance mode scheduler. 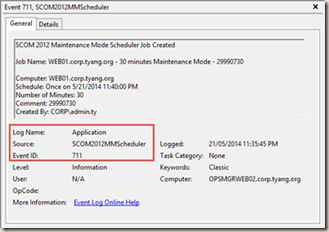 When the Maintenance Mode Scheduler is configure to write auditing events to Windows event log, a event collection rule can be utilized to collect these events and store them in SCOM databases. 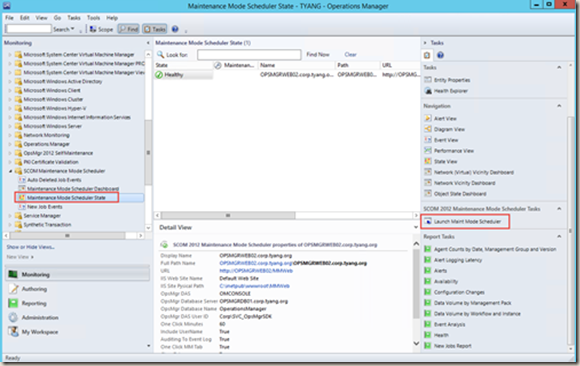 Monitor the credential of SCOM Data Access Account configured in the maintenance mode scheduler. A monitor that checks if the credential of the SCOM Data Access Account configured in SCOM 2012 Maintenance Mode Scheduler is still valid. This is to ensure SCOM operators get notified if the Data Access account password has been changed, or the account has been locked out, disabled or deleted. Monitor if the SCOM Data Access Account has local administrator privilege on the computer hosting the maintenance mode scheduler. A monitor that checks if the SCOM Data Access Account configured in SCOM 2012 Maintenance Mode Scheduler has local administrator privilege on the computer hosting the scheduler. 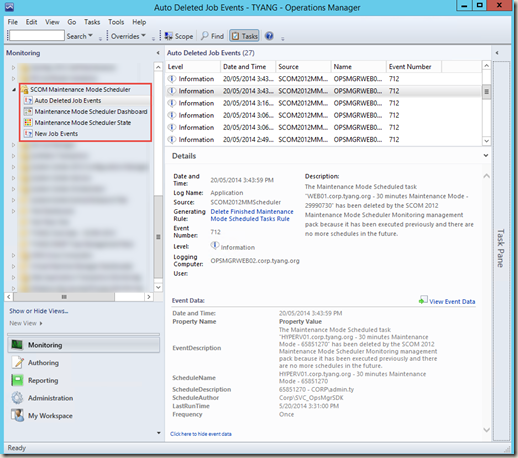 Windows local administrator access is required to create Windows Scheduled task. 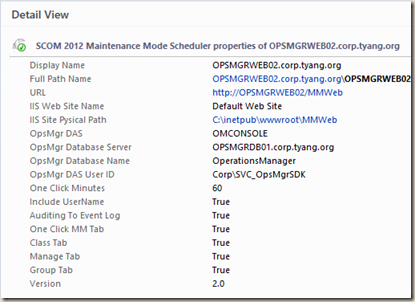 Console task to launch the SCOM 2012 Maintenance Mode Scheduler web site using the default web browser. 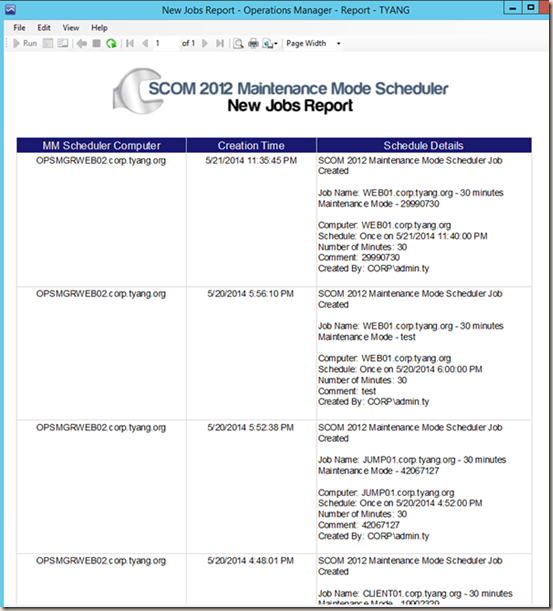 Maintenance Mode Scheduler dashboard (Provided by the SCOM 2012 Maintenance Mode Scheduler Dashboard management pack). 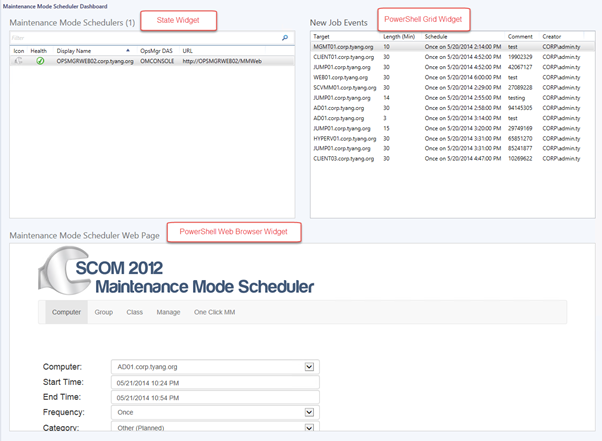 PowerShell Web Browser widget that displays the Maintenance Mode Scheduler web page. 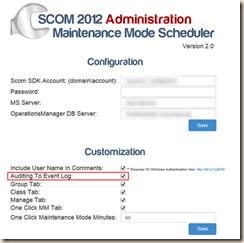 I’d like to thank Tim McFadden for producing such a good maintenance mode tool for SCOM 2012, and also the valuable feedbacks and suggestions provided for this management pack. First time writing scripts for IIS (as this is a web based application). First time using the new PowerShell widgets from the SCOM 2012 R2 UR2 updates (well, they’ve only just come out). So I was really enjoying it, although it took a lot longer than what I expected (due to the IIS scripting challenges I had). 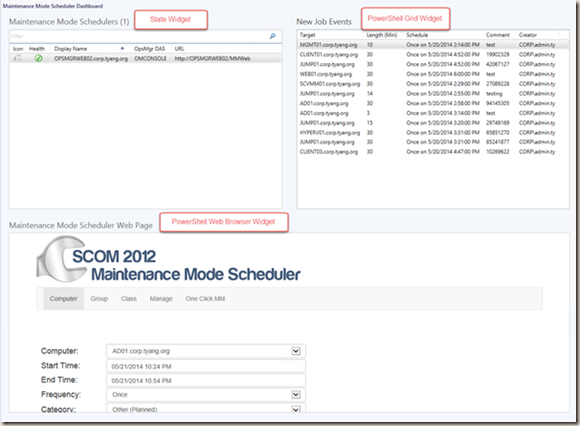 I hope this management pack would help the community to better adopt and integrate the SCOM 2012 Maintenance Mode Scheduler into their SCOM 2012 environments. The Management packs and documentation can be downloaded HERE. Please make sure you read the documentation before importing the MPs. there are few pre-requisites for the MPs. Lastly, as always, please feel free to contact me if you have issues / questions / suggestions. I created the dashboard in a R2 UR2 environment. I wasn’t sure if it will work in SP1 UR6 as stated in section 6 of the documentation. you can try to unseal the dashboard MP and change the reference MP version number. Please let me know if it works. I’m not sure without looking in MP, and I don’t have a SP1 management group I can test. Sorry. I’ve recently imported your Management packs to test out Tim’s MMS tool (which is superb) however I get the following powershell error during discovery. Any ideas what could be causing this? I'v extracted script from the MP and stepped through it manually and it can pull back the UPN of the account being used. So I'm doubly confused. I had the same issue in my lab: the DAS/SDK service account did not have a UPN (@). it only had a pre 2000 logon name format \. if this is the case, please update the service account in AD. Thanks for the quick reply. I can confirm my DAS/SDK Account does already have a UPN. However we have multiple UPN’s in our Domain, could this be an issue? Exporting the MP and copying the script out and running it manually appears to work. Certainly the variables ion the script are all populated correctly with results. Being able to see which user name the script thinks it’s failing would be great an help a lot in my trying to work out why this doesn’t work in my environment. I’ve double checked the script, I can’t see anything wrong with that line. Could you email me a screenshot and show me what does this odd quote look like? One from the powershell ISE which is the script copied out of the Management pack. The other is from Notepad++ with the whole unsealed MP loaded. there’s nothing wrong with it. the backtick is the escape character in powershell. Hi – strongly recommend that you check that your backticks are natively UTF/ASCII values. I’ve been caught by this many times when copying stuff between web pages and ASCII editors. Just a thought. I have asked the Windows Admins and theyhave verified that the DAS account does indeed have a UPN account and that it is not a pre 2000 logon name format. We do however have DC running on Windows 2008 and Windows 2012. We also notice that the Heath State monitor for the Maintenance Mode Scheduler in the dashboard is permanently stuck in an empty circle icon (unmonitored). 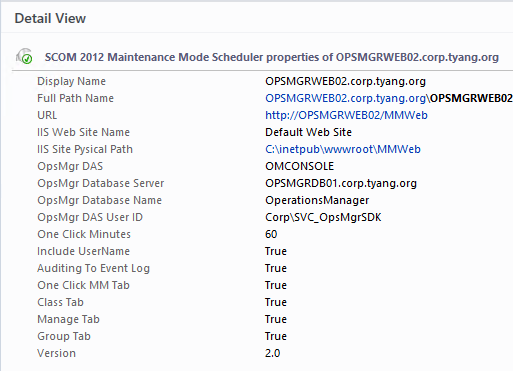 Also, when we look at the Schedule Maintenance Mode view thgew actual web page is missing the top-most section of the tool including the buttons allowing you to change the target object to place into maintenance mode so the only option seems to be to schedule a single computer into maintenance mode. Can you please suggest what may be wrong? I also have the same error and the account has a UPN. Does the account name need to be entered in UPN format when configuring the scheduler ? I am not seeing the same information here that you guys do. My Web Page Scheduler area shows the mmweb page. 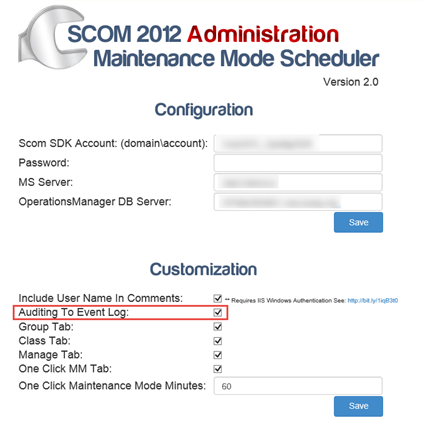 I only have the SCOM server listed under maintenance mode even though I have a schedule created through the MMWEB page. No new job events. Something is amiss. Any help?